Taizu is a trendy and tasteful eatery with a unique ambiance and flavorful dishes. Chef Yuval Ben Neriah’s inspiration for Taizu came from his personal interpretation of street foods in India, Thailand, China, Cambodia and Vietnam. When I first arrived at Taizu, I was amazed by the chic and elegant interior. I have been to many restaurants in my two-months in Israel and Taizu completely blew me away. 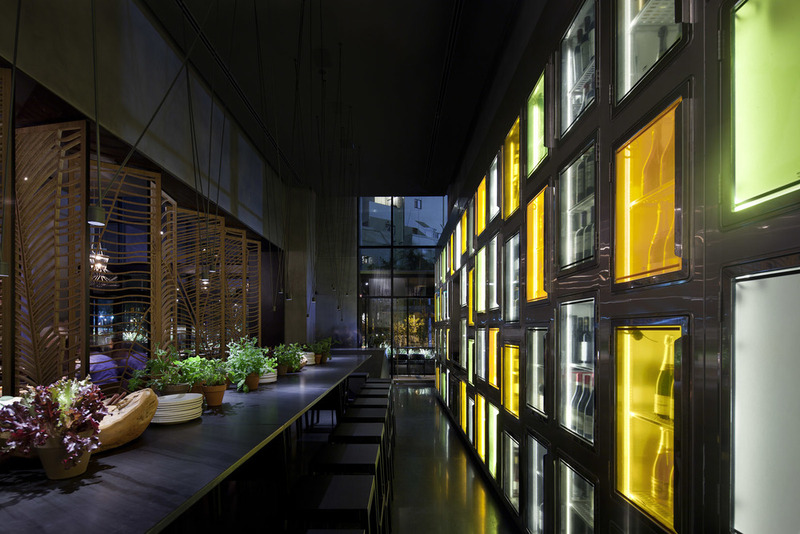 It is unlike any traditional Tel Avivian restaurant, and that is one of its many unique qualities. Taizu has a very sleek and sophisticated feel along with sensory appealing designs and tastes. Just by looking at the space, I knew my meal would be without a doubt incredible. Taizu proved me correct. The night commenced with a trio-cocktail sampler. My personal favorite was the Green Tai, combining litchi cream, green tea, sake, and spicy peppers for a sweet yet fiery pick-me-up. Next, came the appetizers. The menu is divided into five sections, starting off with more subtle and delicate flavors and gradually building up towards the more heated flavors. The wild fish tartar started off the food portion of the night with a bang. It was served in a crispy rice cone and resembled an ice cream cone but with a fish topper. The wild fish carpaccio did not disappoint either. I am a devout fish and seafood enthusiast so these dishes were right up my alley! Next came a few variations of dumplings including shrimp and scallops. Some of my favorite tastes included the tandoori calamari, fresh mussels, and tandoori soft chicken. I am not a huge Indian food fanatic, but this tandoori was the best I have ever had - a tribute to the talented chef's expertise. You practically had to grab the plate away from me because I was devouring each and every sauce. Each one was better than the last, providing my stomach with deep gratification. Overall, my dining experience at Taizu was one of the best I have had in Tel Aviv. The combination of contemporary décor paired with palatable tastes and excellent service made Taizu a place I would highly recommend for anyone looking for a unique Asian-Fusion eatery. This restaurant is suitable for any occasion from a business dinner to a date to a night out with friends. Taizu is 100% Delicious Israel approved! Older PostThe Vegan and Gluten-Free Diet… Just a Fad or Here to Stay?